Goichi Suda (also known as Suda 51) said he is interested in making games to make use of the upcoming Project Natal and PlayStation Motion Controller. With No More Heroes 2 hitting UK shelves, Grasshopper Manufacture CEO Suda 51 made his way to London to help with the launch and talk about his upcoming plans for the newest gaming technology. Suda 51 said he is interested in making games to make use of the upcoming Project Natal and PlayStation Motion Controller. 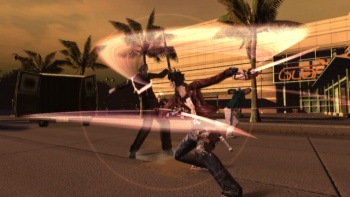 He has no intention of remaking No More Heroes, but instead plans to make original products specifically geared to the new technology with the specific control scheme integrated into the game to fully utilize the potential of the motion control devices. Also mentioned were Suda 51's admiration of Heavy Rain, saying he would like to make a title in that style someday. Suda 51 said he appreciates "new designs and anything that gives new experiences to the players." He admitted, however, that making the game may be a bit tricky in the current Japanese development climate, but with the differing tastes of the American and European market, such a game is still viable. Suda 51 is known for making rather unique if not bizarre games, so it will be interesting to see what he whips up for Natal and the PlayStation Motion Controller.